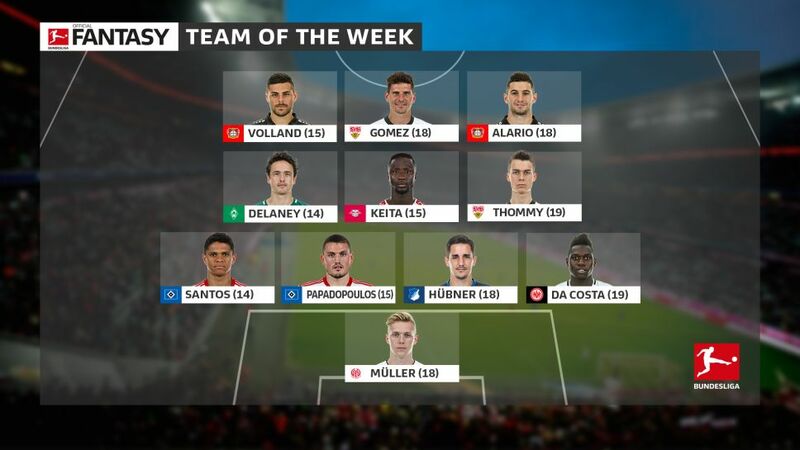 Bayer Leverkusen and VfB Stuttgart are the big hitters in the Bundesliga Matchday 25 Team of the Week, but not a single player from the current top three - Bayern Munich, Schalke and Borussia Dortmund - makes the cut. What a debut from young Müller. The 20-year-old pulled off save after save - six in total - as ten-man Mainz held on for a point in their relegation six-pointer with Hamburg. To top it off, the Bundesliga MD25 Man of the Matchday even saved a 62nd-minute penalty from Filip Kostic. Da Costa enjoyed his best performance in a Frankfurt shirt in the 1-0 home win over Hannover. The former Ingolstadt man scored his first Bundesliga goal in his 37th top-flight outing, while only Eintracht's Ante Rebic had more attempts on goal than the Brazilian (three) and Makoto Hasebe more touches (67). Hübner put on a defensive clinic in Hoffenheim's 2-0 win at Augsburg. The towering centre-back won 68 per cent of his attempted challenges and set up Andrej Kramaric for the opening goal. A standing ovation from the travelling faithful was just reward for Thommy, who chimed in with all three assists as Stuttgart came from a goal down to beat Cologne. All told, he was involved in seven of Die Schwaben's nine goal attempts, firing in a match-leading four efforts of his own. There's no debating who Leverkusen's matchwinner was against Wolfsburg. Alario sunk his first penalty in the Bundesliga, before turning provider for Julian Brandt. The Argentinian also threw himself into a match-high 42 challenges. Fantasy gold. The Stuttgart veteran scored twice at Cologne's RheinEnerigeStadion - his first brace since returning to the club during the winter transfer window - and attempted more challenges than any other player (29). He didn't score or assist, but that was not for Volland's want of trying. The Germany striker was involved in more goal attempts (eight) than the entire Wolfsburg team combined (eight), his four shots on goal being a best-mark for the game.